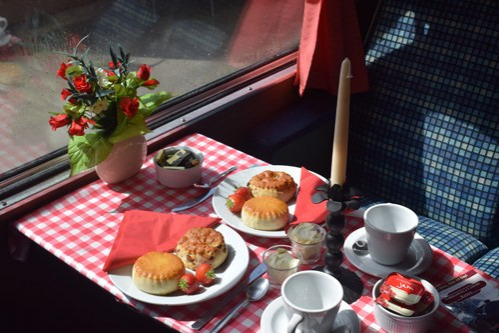 Take a ride on one of our Cream Tea Special trains with the family and ride through the Northamptonshire countryside as a locomotive pulls you along on a 4-mile round trip; while enjoying a lovely cream tea, served to you by our dedicated volunteers. Travel in first class and enjoy a cream tea served with tea or coffee (other drinks available – not included in the ticket price). Afterwards, enjoy a walk along the Brampton Valley Way a 14-mile “linear park” along the historic Northampton to Market Harborough line, or take another ride (2nd Class) on the train with your All Day Rover ticket (included in the price). NLR are unable to provide Wheelchair access to our trains. This is temporary while we are refurbishing our Wheelchair accessible coach. We apologise for any inconvenience this causes.